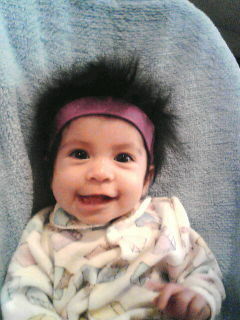 The day after Cristmas, I noticed Lili's bottom gums were swollen and it felt like a tooth was coming in. Two days later, it has cut through! She officially has her first tooth! I remember Chone got hers really late, but not this one. She is 4 months and a week and already has a tooth! It still doesn't beat Lisa, who was born with a tooth. thats my little mama bear! Just like her Nina, get those teeth in early! That is so awesome. I can't believe that they are big enough to even have teeth! Lil' Christian got his teeth at that age EXACTLY! Joey is 8 months tomorrow and still only has his 2 bottom teeth.